Tumor initiation is often linked to a loss of cellular identity. Transcriptional programs determining cellular identity are preserved by epigenetically-acting chromatin factors. Although such regulators are among the most frequently mutated genes in cancer, it is not well understood how an abnormal epigenetic condition contributes to tumor onset. In this work, we investigated the gene signature of tumors caused by disruption of the Drosophila epigenetic regulator, polyhomeotic (ph). In larval tissue ph mutant cells show a shift towards an embryonic-like signature. Using loss- and gain-of-function experiments we uncovered the embryonic transcription factor knirps (kni) as a new oncogene. The oncogenic potential of kni lies in its ability to activate JAK/STAT signaling and block differentiation. Conversely, tumor growth in ph mutant cells can be substantially reduced by overexpressing a differentiation factor. This demonstrates that epigenetically derailed tumor conditions can be reversed when targeting key players in the transcriptional network. When an animal is developing as an embryo, different cells start to specialize into the specific cell types needed to form the tissues and organs of the body. How an individual cell commits to become a certain type of cell is mostly determined by which of the genes in its DNA are active. In animal cells, DNA is wrapped around proteins called histones, and one way that cells can maintain their distinct pattern of gene activity is via chemical tags on the histones. These tags can switch nearby genes on or off, and are added or removed by other proteins called epigenetic regulators. The epigenetic tags are also stably inherited when the cell divides, meaning that a cell’s identity can be maintained over many cell generations. If epigenetic regulators fail to work properly or get disrupted, the pattern of gene activity in a cell becomes altered. As a consequence, that cell can lose its identity and will often turn into a cancer cell. In fact, mutations in epigenetic regulators are found in several human cancers. It is not yet understood how these changes in gene expression lead cells to become cancerous. Torres et al. have now analyzed an epigenetic regulator called Polyhomeotic in developing larvae of the fruit fly, Drosophila melanogaster. The results show that when Polyhomeotic is not produced the fly larvae develop tumors. Moreover, the mutant cells without Polyhomeotic had different gene expression profiles compared to normal cells. This in turn caused the mutant cells, which had previously committed to a certain fate, to become more like the unspecialized cells found in early embryos. Torres et al. next showed that, among the genes that were incorrectly regulated when Polyhomeotic’s activity was compromised, one gene called knirps was switched on by mistake, which led the mutant cells to become tumor cells. When the activity of knirps was reduced instead, almost no tumors grew. Additionally, Torres et al. found that the protein encoded by knirps activates a signaling pathway that keeps tumor cells unspecialized by blocking their normal progress to a more mature and specialized state – a process known as differentiation. Experimentally raising the levels of a different molecule that ultimately promotes differentiation caused the tumor cells to grow less. These findings suggest that tumors caused when epigenetic regulation goes awry may be reversed by targeting key genes such as knirps. Further work is now needed to test whether these findings will also extend to humans. Forcing cancer cells from a highly dividing, non-specialized state into a dead-end, mature state may lead to new ways to treat cancer. During development, epigenetic regulators are responsible for controlling and restraining cellular plasticity. This tight regulation allows cells to differentiate faithfully and heritably towards a specific fate (Roy and Hebrok, 2015; Wainwright and Scaffidi, 2017). An appropriate balance between proliferation and differentiation is fundamental and multiple regulatory layers of transcription factors and epigenetic regulators are employed to accomplish the underlying transcriptional control (Gonda and Ramsay, 2015; Piunti and Shilatifard, 2016). Many epigenetic regulators are evolutionary conserved and among the most commonly mutated genes in human cancer (Piunti and Shilatifard, 2016). Disruption of epigenetic constraints leads to global reorganization of the epigenome and changes in transcriptional profiles, which might provide a cellular state permissive for tumorigenesis (Wainwright and Scaffidi, 2017). Indeed, disturbed transcriptional profiles and putative oncogenic transcriptional regulators have recently gained significance as better alternatives for therapeutic targets in comparison to signaling pathways. Transcription factors (TFs) are less prone to be bypassed by alternative mutational events, and their perturbation can affect several cancer hallmarks. In addition, due to the complexity of transcriptional networks, it is unlikely that one TF functioning as an oncogenic driver can be entirely replaced by another (Gonda and Ramsay, 2015). For these reasons it is fundamental to identify the core transcriptional networks defining cancer cell types, and target those regulators crucial for survival (Bonifer and Cockerill, 2015). Epigenetic regulators involved in preserving cellular identity are composed of two classes of chromatin proteins, the Polycomb (PcG) and the Trithorax group (TrxG), whose complementary functions maintain the repressed and active gene expression state, respectively (Geisler and Paro, 2015). PcG proteins are organized into two basic complexes, Polycomb repressive complex 1 and 2 (PRC1 and PRC2) (Piunti and Shilatifard, 2016). One example of classical PcG targets are homeotic genes encoding Homeobox TFs, first identified in Drosophila and responsible for correct spatial body development in flies (Shah and Sukumar, 2010; Abate-Shen, 2002). The altered expression of Hox genes in human tumors suggests important roles for both oncogenesis and tumor suppression (Shah and Sukumar, 2010), which further hints towards an role for PcG proteins in oncogenesis. The tumor suppressive role of PcG proteins, in particular PRC1 members in Drosophila imaginal discs, has been extensively investigated (Classen et al., 2009; Martinez et al., 2009). However, the effects on the transcriptional landscape after PRC1 deregulation in tumorigenesis has only recently started to be assessed (Bunker et al., 2015; Loubière et al., 2016). 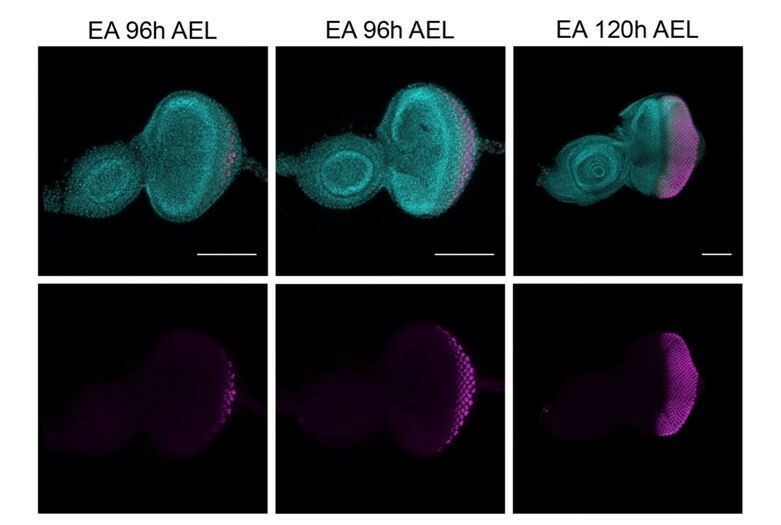 Here, we show that loss of Polyhomeotic (ph), a member of the PRC1 complex, in eye-antennal imaginal discs of larvae leads to a reprogramming of cellular identity towards an embryonic state and a concomitant loss of differentiation markers. Among the reactivated genes is knirps, an orphan nuclear hormone receptor. Depletion of knirps revealed its vital role in tumor maintenance, while misexpression showed its capacity to drive tumorigenesis in otherwise wild-type tissues. Tumors initiated by ph disruption or misexpression of knirps share features such as ectopic activation of JAK/STAT signaling and a differentiation block. We conclude that the embryonic TF knirps is an oncogene in eye-antennal imaginal discs and is crucial for the tumorigenic capacity of the epigenetic tumor under study. Additionally, we found that overexpressing a pro-neural TF leads to reduction of proliferation and suppression of the tumor phenotype. ph505 mitotic mutant clones were generated using the Flp/FRT system, allowing for specific tumor growth within eye-antennal imaginal discs (from here on referred to as ph505-tumor). Mutant clones were fluorescently labeled with GFP, by using the mosaic analysis with a repressible cell marker (MARCM) system (Wu and Luo, 2006). 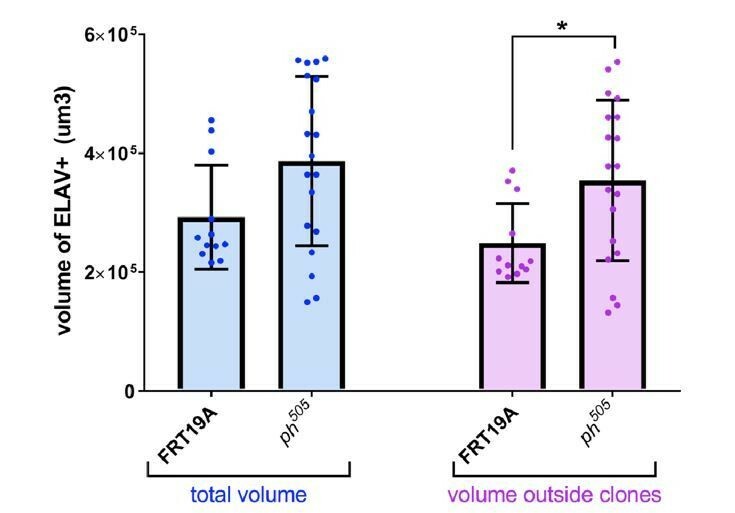 Reduced expression of Ph in the mutant clones compared to tissues carrying FRT19A (neutral) mitotic clones was observed (Figure 1—figure supplement 1A–B). Only a small number of larvae carrying ph505-tumors reached adulthood (Figure 1—figure supplement 1C). The majority of tumors arising in these epithelial tissues display disrupted cell polarity (Martinez et al., 2009), which was confirmed using the cell adhesion marker Armadillo (Figure 1—figure supplement 1D–E). Additionally, we observed ectopic expression of Matrix metalloprotease 1 (MMP1) (Figure 1—figure supplement 1F–G), which is required for matrix degradation and the invasive potential of tumor cells (Christofi and Apidianakis, 2013; Uhlirova and Bohmann, 2006). The tumorigenic capacity of PcG mutant tissues has been previously reported (Classen et al., 2009; Martinez et al., 2009). 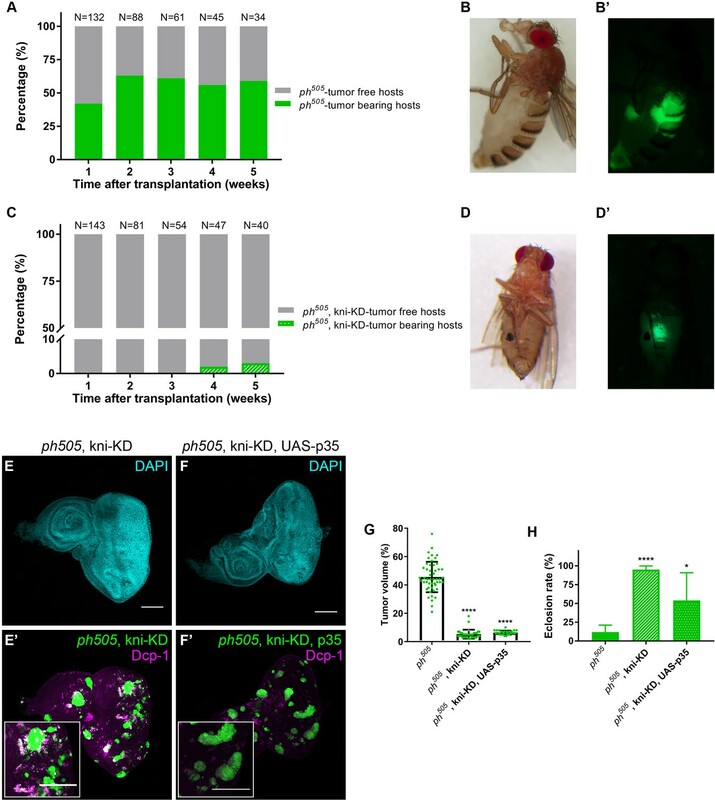 Here we show for the first time that neoplastic growth of ph505 mutant clones in eye-antennal imaginal discs can be rescued by wild-type ph (via UAS-ph) co-expression. The resulting tissues with restored Ph levels harbored smaller clones compared to the tissues containing ph505 clones (Figure 1—figure supplement 1H–I). To better quantify changes of tumor volume in these tissues we developed an image analysis pipeline (see Materials and methods). This enabled us to concomitantly measure the volume of mutant clones (GFP-labeled) as well as the volume of the tissue. We found that in tissues with ph505 clones 46% of the disc was composed of tumor cells, while in the rescue experiment this ratio was reduced to only 7% (Figure 1—figure supplement 1K–N). Consistent with these observations, a reduced number of larvae carrying ph505-tumors reached adulthood (eclosion rate <20%). In contrast the eclosion rate of ph505, UAS-ph pupae (97%) was similar to control flies (99%) (Figure 1—figure supplement 1J). Overall, these results show that the tumorigenic phenotype of ph505 tissues is primarily due to the loss of ph since it can be rescued by the expression of the wild-type protein. We had shown previously that tumors with impaired ph do not accumulate genetic instabilities, even when cultivated for prolonged time in adult hosts (Sievers et al., 2014). Hence, the observed neoplastic behavior can be solely restricted to the loss of the silencer ph and the ensuing deregulation of the transcriptional state described below. To better understand the molecular consequences of polyhomeotic loss-of-function in vivo, we analyzed the transcriptome of ph505-tumor cells by RNA sequencing (RNA-seq). We used fluorescence activated cell sorting (FACS) of dissociated eye-antennal imaginal discs to separate GFP-labeled tumor cells from surrounding unlabeled and non-mutant cells (Martinez et al., 2009; Dutta et al., 2013; Harzer et al., 2013). This proved to be an essential step for an accurate diversification of the tumor transcriptome. Transcriptome analysis showed substantial deregulation of gene expression in mutant cells compared to neighboring non-mutant cells. We identified 1337 differentially expressed genes (Benjamini adjusted p-value, padj. <0.01), with 275 genes being upregulated in ph505-tumor cells (Figure 1A, Figure 1—figure supplement 2A, Figure 1—source data 1). Furthermore, gene set enrichment analysis revealed that neurogenesis-related genes were mainly downregulated in ph505-tumor cells, while genes regulating transcription were upregulated (Figure 1B). Since PcG target genes encode crucial developmental regulators, such as TFs (Simon and Kingston, 2009), our expression data corroborates its impaired function. Moreover, we observed deregulation of genes involved in tissue development (e.g., GO-terms for genital disc development, imaginal disc development) and enrichment for TFs among the upregulated genes (GO-term sequence-specific DNA binding transcription factor activity) (Figure 1B, Figure 1—source data 2). The observed global modulation of transcription output is in agreement with PcG proteins constituting a global regulatory system (Simon and Kingston, 2009). Gene expression analysis of ph505-tumor cells reveals loss of cell identity and acquisition of an embryonic-TF signature. RNA-sequencing was performed in FACS-sorted ph505 tissue samples. Gene expression in tumor cells (GFP+) was compared with surrounding wild-type cells (GFP-) from the same pool of eye-antennal tissues. Volcano plot in (A) shows 1337 differentially expressed genes: 1062 genes are downregulated (pink) and 275 are upregulated (green) (padj ≤0.01, Benjamini). Names of 6 genes are provided in the volcano plot: cad, eve, kni, eya, elav, ato. Representation of selected Gene Ontology (GO) terms that were found enriched (for details please check Figure 1—source data 2) (B). Green/Pink light bars correspond to the expected number of genes for each category, Green/Pink dark bars correspond to the number of observed hits in our analysis. Black bars correspond to the log10(padj). Pink, downregulated genes; green, upregulated genes. Heatmap and respective dendogram obtained for clustering analysis with 83 samples (Figure 1—sources data 3 and 4) (C), showing tumor samples clustering together with early embryos. ph505-tumor samples in black (**), control samples (#) in grey and other tumor samples (brat- and RASV12/Scrib- tumors) are highlighted below the clustering. Embryonic transcription factor Even-skipped (Eve) is not detected in FRT neutral clones (D) but is ectopically expressed in ph505 clones (E). Scale bar corresponds to 100 µm. All microscope images are a maximum intensity projection of all z-stacks acquired for the tissue (DAPI, cyan; GFP MARCM clones, green; antibody staining, magenta). See also Figure 1—figure supplements 1–4 and Figure 1—source datas 1–4. TFs are essential to define cell types and are among the main targets of PcG silencing (Simon and Kingston, 2009). As such, we decided to focus on the fraction of differentially expressed TF-encoding genes, due also to the enrichment of genes in this category in our RNA-seq dataset. We evaluated which upregulated TFs, and thus the primary response to the ph knock-out, could be contributing to the overall deregulation of gene expression observed. Employing the iRegulon tool (Janky et al., 2014), predictions based on motif enrichment revealed caudal, grain and knirps (direct Ph targets in eye discs [Loubière et al., 2016]) as TFs putatively responsible for all differentially expressed genes in our RNA-seq dataset. To further reveal the transcriptional identity of ph505-tumor cells, we integrated available datasets from the Gene Expression Omnibus (Edgar et al., 2002) and compared the gene expression signature of ph505-tumors with other tissues and/or developmental stages of Drosophila. In total, 83 samples including different tissues and cell types (namely ovaries, larval brain, adult head, wing disc, eye-antennal disc, larval neurons and larval neuroblasts) and developmental stages (embryo, larva and pupa) were considered for the analysis (Figure 1—source data 3). Specifically, we compared 124 differentially expressed genes involved in transcriptional regulation (GO0006355) (Figure 1—source data 4). Strikingly, hierarchical clustering of 83 transcriptome samples showed that ph505-tumor cells clustered close to samples from early embryonic developmental stages (Figure 1C and Figure 1—figure supplement 2B). As expected, our RNA-seq control samples (neighboring unlabeled cells) clustered with wild-type eye-antennal imaginal disc transcriptomes. 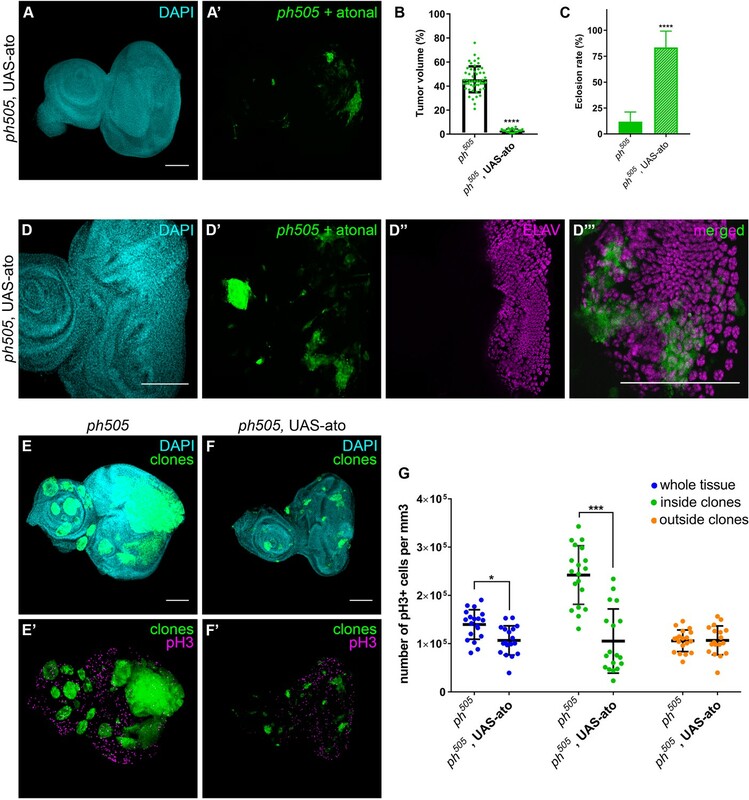 This result might reflect the re-establishment of an earlier developmental program in ph505-tumors as a consequence of a reprogrammed epigenomic state. Additionally, this is not a general feature shared by all tumors, as depicted by other tumor types (i.e. brat [Jüschke et al., 2013] and RasV12/scrib- tumors [Atkins et al., 2016]) not clustering with embryos. We hypothesize that the clustering of ph505-tumor cells with early embryos was not only the result of the ectopic expression of embryonic TFs in the ph505-tumor cells, but also due to reduced expression of the TFs, which characterize differentiated tissues. Downregulation of neurogenesis-related genes suggests that these tumor cells may be unable to differentiate, losing cell fate markers and their normally established identity. We confirmed the downregulation of neurogenesis-related markers at the protein level for ELAV (Embryonic Lethal Abnormal Vision), which is normally expressed in the differentiated neuronal cells that make up the eye imaginal disc (Figure 1—figure supplement 3A–B) and for Eya (Eyes absent, Figure 1—figure supplement 3C–D). This supports previous findings that suggested that neoplastic Drosophila epithelial cells reverse their developmental commitments and switch to primitive cell states (Khan et al., 2013). In this particular report, the switch in the eye primordium was shown to be Homothorax (Hth)-dependent (Khan et al., 2013). Conversely, in our RNA-seq dataset hth was downregulated and at the protein level we confirmed that Hth is not ectopically expressed in the ph505 clones (Figure 1—figure supplement 2E–F). Thus, our study reveals that ph505-tumors do not depend upon ectopic expression of Hth to keep cells in a non-differentiated state and support neoplastic growth. 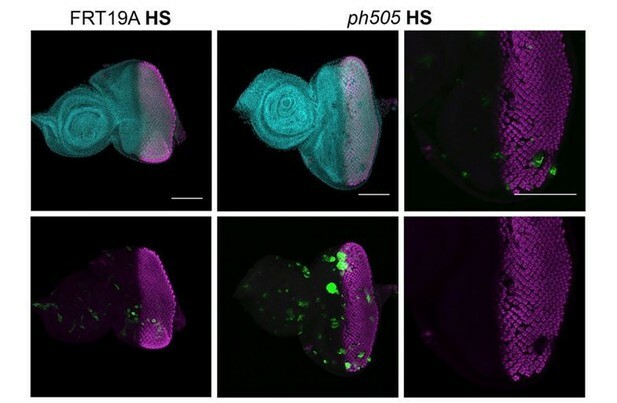 The similarity of the ph505-tumor TF signature with Drosophila early embryos was reinforced by confirmation of the presence of embryonic-TF misexpression across tumor-tissue samples. We performed immunostaining for additional embryonic TFs, namely Even-skipped, Abdominal-B and Caudal, and observed ectopic expression of these proteins specifically in mutant clones (Figure 1D–E and Figure 1—figure supplement 3A–D). Overall, these results suggest that ph505-tumor cells previously committed to a neurogenesis-related path switch their cell fate as they fail to differentiate during the process of tumorigenesis due to the modulation of the transcriptional regulatory program of the cells. In order to pinpoint key regulators of tumorigenesis in ph505-tumors, we performed an in vivo screen for a subset of selected candidates. Among all the TFs upregulated in ph505-tumor cells, we chose, based on literature search, 24 to assess their importance in promoting tumorigenic potential in these cells. Our approach to test the ability of candidate genes playing a key role in ph505-tumorigenesis was to combine generation of ph505-tumor clones with RNAi-mediated knock-down (KD) of a target of interest within these clones. We compared effects of RNAi to the baseline ph505 neoplastic phenotype and observed that some RNAi lines targeting TFs (in ph505 clones) resulted in a strong increase in viability (close to 90–100%, for example cad, drm, kni, bgcn), while others did not change or only slightly changed pupal viability (Figure 2A). We further characterized 6 RNAi lines: crocodile (croc), lateral muscles scarcer (lms), caudal (cad), drumstick (drm), knirps (kni) and benign gonial cell neoplasm (bgcn) (Figure 2B–H), which showed significant differences in eclosion rate in comparison to flies carrying ph505 clones (Figure 2B and Figure 2—figure supplement 1A). The eclosion rate for three of these perturbations (drm-, kni- and bgcn-KD) reached similar levels as control flies (carrying FRT19A neutral clones) and rescue experiment (ph505, UAS-ph). By quantifying tumor volumes relative to tissue size of the six above-mentioned perturbations, we observed that only cad-, drm-, kni- and bgcn-KD showed a significant difference compared to the baseline of 46% tumor volume in the ph505 condition (14, 13, 5 and 14% tumor volume, respectively). In addition, the two perturbations (croc- and lms-KD) that did not show a significant effect on tumor volume were also those with less remarkable differences in eclosion rate (Figure 2B and Figure 2—figure supplement 1B–D). These results suggest that higher eclosion rate is a good approximation for decreased tumor volume. Furthermore, the tissue volume of the eye-antennal imaginal disc in the drm-, kni- and bgcn-KD conditions was closer to the control tissue volume than the ph505 condition (Figure 2—figure supplement 1C). KD of embryonic TFs in ph505-tumors can increase the viability of the flies and reduce tumor volume. Eclosion rates (%) for FRT19A control, ph505 and for specific KD in ph505 background (ph505 +UAS RNAi). Fly stocks carrying RNAi constructs were used for the KD of 24 TFs upregulated in ph505-tumor cells (A). Dashed line represents the mean eclosion rate for ph505 larvae. Number of larvae analyzed: FRT19A N = 163; ph505 N = 784; ph505, UAS-ph N = 48; for each TF-KD in ph505 background: btd- N = 329, grn- N = 256, vvl- N = 250, odd- N = 108, Dr- N = 96, Sox100b- N = 304, Kr- N = 309, gsc- N = 177, fkh- N = 231,pb- N = 110, Doc1- N = 337, Doc2- N = 128, Doc3- N = 297, AbdA- N = 119, AbdB- N = 129, nub- N = 216, tin- N = 54, eve- N-117, croc- N = 355, lms- N = 58, cad- N = 137, drm- N116, kni- N = 340, bgcn- N = 158. Targets whose KD induced a significantly different eclosion rate compared with ph505 were further characterized at the tumor volume level (B). Number of tissues analyzed per condition: ph505 N = 50; ph505, UAS-ph N = 23; ph505, croc-KD N = 26; ph505, lms-KD N = 29; ph505, cad-KD N = 30; ph505, drm-KD N = 33; ph505, kni-KD N = 35; ph505, bgcn-KD N = 28. Percentage of tumor volume is significantly reduced in 4 out of 6 perturbations compared with ph505 alone (46%): 14% in ph505, cad-KD; 13% in ph505, drm-KD; 5% in ph505, kni-KD; and 14% in ph505, bgcn-KD. ph505, UAS-ph condition leads to reduction of tumor volume to 7% and is shown here as a control of the rescue phenotype. Examples of eye-antennal imaginal discs from six different genotypes used for quantification of tumor volume (C–H). Scale bar corresponds to 100 µm. All microscope images are a maximum intensity projection of all z-stacks acquired for the tissue (DAPI, cyan; GFP MARCM clones, green). Data (A–B) are represented as mean ± SD. Statistics: ****p<0.0001; ***p<0.001; *p<0.05. See also Figure 2—figure supplement 1 and 2. From all the RNAi conditions tested, kni-KD in ph505 mutant clones showed the most striking decrease in tumor volume (9.2 fold decrease), similar to the rescue experiment (ph505, UAS-ph) (Figure 2B). Additionally, the phenotype of adult eyes of this genotype suggests a recovery of the differentiation program (Figure 2—figure supplement 2A–D). This is supported by immunostaining against ELAV showing that it is no longer disrupted when expression of kni is blocked in ph505 (Figure 2—figure supplement 2E). Altogether, this shows that the differentiation block observed in ph505-tumors is prevented upon reducing the level of knirps expression by RNAi KD. We confirmed that a second, independent RNAi line against kni also led to a significant decrease of tumor volume (14% of tumor volume vs. 46% in ph505) and an increase in eclosion rate (85%) (Figure 2—figure supplement 2F–J). We can thus minimize the chance that the effects observed using either kni-RNAi were due to off-target effects. We characterized the tumorigenic potential of ph505-tumors and ph505, kni-KD by conducting transplantation assays (Rossi and Gonzalez, 2015) of these tissues into the abdomen of adult host flies (Figure 3A–D). In the case of the ph505-tumors the percentage of tumor-bearing hosts increased from 40% to 60%, from the first week to subsequent weeks after transplantation indicating hyperproliferation of the transplanted tissues (Figure 3A). The tumorigenic potential of ph505-transplanted tissue was already detected on day seven after transplantation (Figure 3B). By contrast, when transplanting ph505, kni-KD clones we did not observe any tumors in the host flies within the first three weeks. Even after up to 5 weeks post-transplantation, we could only find a single fly with GFP+ tissue overgrowth (Figure 3C–D). Our data demonstrate that the TF Knirps plays a crucial role in tumorigenesis of ph505-tumors given that kni-KD in these tissues not only led to a reduction of tumor volume but also the remaining clones were not able to proliferate in the host fly abdomen. kni-KD in ph505-tumors has anti-oncogenic effects Percentage of ph505 tumor-bearing hosts over time ranges from 40–60% (A). Evasion of apoptosis is one of the hallmarks of cancer (Hanahan and Weinberg, 2000). As we observed a significant reduction of tumor volume upon depleting kni in ph505 mutant cells, we hypothesized that kni-KD could trigger cell death of tumor cells. We blocked apoptosis within mutant clones (via expression of anti-apoptotic protein p35 [Hay et al., 1994]). Levels of apoptosis as assessed by immunostaining against Death caspase-1 (Dcp-1) confirmed a decrease in apoptosis in tissues where p35 was expressed in ph505, kni-KD clones (Figure 3E–F and Figure 3—figure supplement 1A–B). However, we observed that blocking apoptosis in ph505, kni-KD clones was not sufficient to revert the anti-oncogenic effects of kni-KD (Figure 3G–H and Figure 3—figure supplement 1C–F). Furthermore, the tumor volume of ph505, kni-KD, UAS-p35 was similar to ph505, kni-KD (Figure 3G and Figure 3—figure supplement 1D–F). We also tested the effect of this particular RNAi line in the context of neutral clones generated with the same driver as for ph505-tumors. These FRT19A, kni-KD flies showed neither difference in eclosion rate nor in the adult eye phenotype, compared to control flies (Figure 3E–F and Figure 3—figure supplement 1C). This suggests that the RNAi line targeting kni does not per se affect eye-antennal imaginal disc development. Ectopic expression of cell fate-specifying TFs was recently shown to lead to the formation of epithelial cysts (Bielmeier et al., 2016). Cyst formation in wing and eye imaginal discs represents a response to cell fate mis-specification, compromising tissue integrity and potentially promoting precancerous lesions. We thus assessed the effect of ectopic kni expression in eye-antennal imaginal discs by generating mitotic clones using again the eyFlp system. We observed that FRT19A clones expressing kni (Figure 4A) displayed a more pronounced round shape in comparison to the notchy-shape of FRT19A neutral clones (Figure 1—figure supplement 1A). Additionally, ectopic kni expression compromised the viability of the flies, evidenced by an eclosion rate of only 35% (Figure 4B), and the defective development of the adult eye structures (Figure 4C). Furthermore, we confirmed that ectopic expression of kni leads to the formation of cysts (Figure 4D) and thus interferes with epithelial polarity (Figure 4D and Figure 5—figure supplement 1A). Knirps misexpression induces cyst formation in imaginal discs and is sufficient to drive tumorigenesis. Ectopic expression of knirps in eye-antennal imaginal discs shows a distinct pattern of clones (A–A’). Eclosion rate (B) for FRT19A and FRT19A, UAS-Kni. 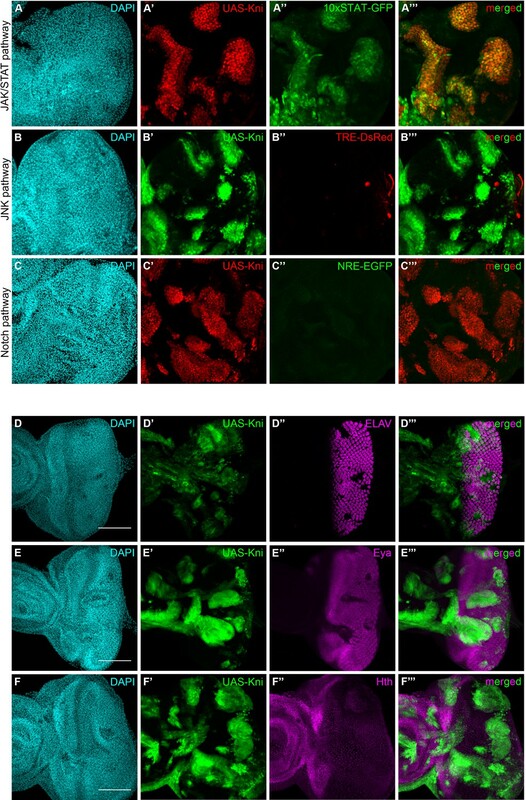 Ectopic expression of kni in these particular tissues compromises the viability of the flies. Number of larvae analyzed: FRT19A N = 163; FRT19A, UAS-Kni N = 441. Ectopic expression of knirps in eye-antennal discs compromises normal eye development as assessed by adult eye structures (C). Formation of cysts in tissues carrying ectopic expression of kni (D–D’), highlighted by middle sections (five middle Z-stacks) with Phalloidin staining (D’’). Insets (i and ii) for orthogonal views (YZ) are shown and cutting plane is depicted in (D’’–D’’’). Assays of transplantation were performed with tissues carrying ectopic expression of kni (E). Tumor-bearing hosts were observed 3 weeks after transplantation (<25% of hosts). In week 5, almost 50% of the hosts that survived carried GFP+-tumor tissue. Blue bars represent the percentage of hosts with tumors, while grey bars show percentage of hosts without tumor. Tumor-bearing host on week five is shown in (F) and tumor fluorescence in (F’). Scale bar corresponds to 100 µm. All microscope images are a maximum intensity projection of all z-stacks acquired for the tissue, except where otherwise stated (DAPI, cyan; GFP MARCM clones, green; antibody staining, magenta). Data (B) are represented as mean ± SD. Statistics: ****p<0.0001. See also Figure 5—figure supplement 1. To test if ectopic expression of kni alone is sufficient to drive tumorigenesis we conducted transplantations of eye-antennal imaginal disc tissues ectopically expressing kni. We observed that knirps is sufficient to generate tumors in the host flies, visible 3 weeks after transplantation (ranging from 15–50%, from week 3 to 5 after transplantation respectively) (Figure 4E–F). Our data suggest that ectopic expression of knirps interferes with the normal course of development and that knirps is a new oncogene, possibly acting in a context/tissue-dependent manner. Since knirps-KD alone was sufficient to reduce the tumorigenic potential of ph505-tumors, we hypothesized that some features of clones ectopically expressing knirps in a wild-type context could resemble ph505-tumor clones. We therefore evaluated the activation of signaling pathways in this context. We observed that of the JNK, JAK/STAT and Notch signaling pathways (all are activated in ph505-tumors [Classen et al., 2009; Martinez et al., 2009; Beira et al., 2018]), only JAK/STAT was ectopically activated, particularly in knirps cyst-like clones (Figure 5A–C). 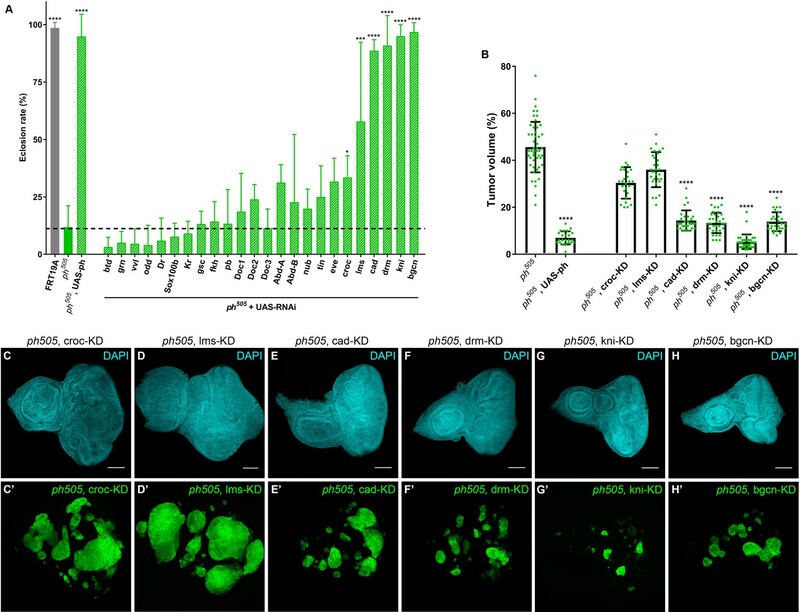 This observation suggests that ectopic expression of knirps alone is sufficient to activate the JAK/STAT pathway in mitotic clones. Hence, ectopic activation of the other signaling pathways in ph505-tumors is likely attributable to other factors regulated by Ph and independent of knirps. Knirps misexpression induces JAK/STAT activation and compromises differentiation. Activity of JAK/STAT, JNK and Notch signaling pathways in the context of kni-ectopic expression in eye-antennal discs was assessed by evaluating the expression of the respective activity reporters: 10x STAT-GFP (A, RFP MARCM clones in red, JAK/STAT reporter in green), TRE-DsRed (B, GFP MARCM clones in green, JNK reporter in red) and NRE-EGFP (C, RFP MARCM clones in red, Notch reporter in green). Ectopic expression of STAT is specifically observed in kni cyst-like clones (A’–A’’’). JNK and Notch pathways are not ectopically activated in UAS-Kni clones. Differentiation of eye progenitors is compromised as observed by ELAV and Eya protein expression (D–E). Normal ELAV and Eya protein expression is interrupted in the presence of Kni ectopic clones, particularly in cysts (D’’’ and E’’’), without ectopic expression of Hth (F). Scale bar corresponds to 100 µm. All microscope images are a maximum intensity projection of all z-stacks acquired for the tissue (DAPI, cyan; GFP MARCM clones, green, unless otherwise stated; antibody staining, magenta). See also Figure 5—figure supplement 1. In light of the compromised eye development seen in kni-ectopic flies, and suggestions that the JAK/STAT pathway needs to be switched off to allow differentiation (Amoyel and Bach, 2012), we investigated the expression of a number of neurogenesis-related markers in kni-ectopic eye-antennal imaginal discs. Similarly to what we observed with ph505 clones, ELAV expression was disrupted in kni-expressing cyst-like structures, as shown in Figure 5D, as well as Eya (Figure 5E), without ectopic activation of Hth (Figure 5F). These observations are thus in agreement with the hypothesis that knirps alone is sufficient to initiate tumorigenesis. Our data argue in favor of a role for JAK/STAT in contributing to the differentiation block in ph505 and kni-ectopic tumors. We decided to block this pathway in ph505-tumors (ph505, dome∆CYT) and examine cellular differentiation in these eye-antennal imaginal discs. Upon blocking JAK/STAT in ph505-tumors, we observed that ELAV expression is re-established almost to a normal situation, even in the presence of clones (Figure 5—figure supplement 1B in comparison to Figure 1—figure supplement 3B). Moreover, the viability of these flies is increased, close to normal levels (Figure 5—figure supplement 1C, eclosion rate 85%) and some adult flies presented eye structures similar to wt individuals Figure 5—figure supplement 1D). Blockage of normal differentiation appears to be a common feature between ph505 and kni-ectopic tumors in eye tissues, suggesting that kni expression in the ph505-tumors contributes to the differentiation defects observed (Figure 1—figure supplement 3 and Figure 2—figure supplement 2C). Hence, we expected that apart from the knock-down of an embryonic TF with tumorigenic capacity, forcing differentiation of tumor cells could restrain the tumorigenic phenotype. Atonal (ato), encoding a pro-neural TF, was previously shown to have an anti-oncogenic role in the fly retina, where it instructs tissue differentiation (Bossuyt et al., 2009). Notably, ato is also among our downregulated set of genes (padj. <0.01). We ectopically expressed ato in ph505 clones, which led to the rescue of the phenotype by a reduction of the tumor volume from 46% baseline to 3% and an increase in the eclosion rate from 12% to 84% (Figure 6A–C and Figure 6—figure supplement 1A–E). Hence, expression of ato in ph505 clones was sufficient to restore the normal pattern of differentiation of this tissue, as confirmed by the expression of ELAV (Figure 6D and Figure 6—figure supplement 1G). Indeed, also the eye phenotype of the hatched flies resembled the phenotype of wild-type flies (Figure 6—figure supplement 1F). We then asked whether these effects can be attributed to the capacity of atonal in preventing proliferation, as previously shown in a different tumor model (Bossuyt et al., 2009). To test this hypothesis, we assessed levels of phospho-histone H3 (pH3) as a measure of proliferation (Figure 6E–G and Figure 6—figure supplement 2). Quantitative analysis showed an overall increase in proliferation levels in ph505-tumor tissues in comparison to control tissues. This was largely due to an increase of proliferative cells outside of ph505 clones (Figure 6—figure supplement 2C). The analysis also showed a decrease in pH3+ cells inside clones co-expressing ph505 and atonal (in comparison to ph505 clones) (Figure 6G). Thus, atonal antagonizes ph tumor growth by counterbalancing proliferation, ultimately leading to a reduction of tumor burden and to a normal eye differentiation pattern. Overexpression of pro-neural TF in ph505-clones suppresses tumor phenotype. Forcing differentiation of ph505 cells by ectopically expressing pro-neural TF atonal leads to a reduction of tumor volume (A–B). Number of tissues analyzed: ph505 N = 50; ph505, UAS-ato N = 23. On average, tumor volume is reduced to 3% of the eye-antennal imaginal disc volume (B). Eclosion rate of larvae of ph505, UAS-ato genotype is increased and comparable to FRT19A neutral clones’ genotype (C). Number of larvae analyzed: ph505 N = 784; ph505, UAS-ato N = 95. ELAV protein expression in ph505 clones expressing UAS-ato (D). Proliferation levels (phospho-histone H3, pH3) upon overexpressing ato in ph505-cells (E–F). Quantitative analysis of pH3+ cell numbers in ph505 and ph505, UAS-ato (G). These values were normalized to the respective volumes, such as ‘whole tissue’ data was normalized to the total tissue volume, ‘inside clones’ normalized to volume taken by GFP+ clones and ‘outside clones’ normalized to the volume of tissue that is GFP-. Number of tissues analyzed: ph505 N = 19; ph505, UAS-ato N = 18. Scale bar corresponds to 100 µm. All microscope images are a maximum intensity projection of all z-stacks acquired for the tissue (DAPI, cyan; GFP MARCM clones, green; antibody staining, magenta). Data (B–C, G) are represented as mean ± SD. Statistics: ****p<0.0001, ***p<0.001, *p<0.05. See also Figure 6—figure supplements 1–2. With the analysis of a ph mutant transcriptome we highlight the complexity of disrupting global gene expression programs and, with that, newly established transcriptional dependencies. Previous approaches of generating PcG-negative transcriptomes investigated gene expression of mutant cells that were deprived from contact with non-mutant cells (using the cell lethal system), which was then compared with wild-type discs composed of neutral clones (Loubière et al., 2016; Bunker et al., 2015). In contrast, we set out to compare ph505 mutant cells with their surrounding wild-type cells to gain potential additional information by taking into account non-autonomous growth effects previously reported (Feng et al., 2011). 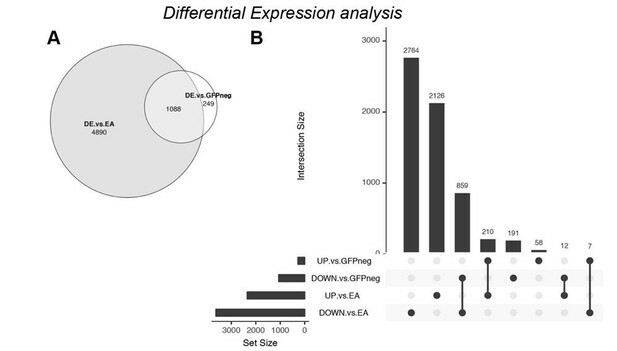 The RNA-seq dataset presented here reveals enrichment for TFs in the upregulated gene set. It also indicates that tumor cells fail to differentiate, supported by the downregulation of neural-cell fate markers characteristic of this tissue and by the upregulation of embryonic TFs. This is also highlighted by the clustering of the TF-signature of ph505-tumors with embryonic stages of Drosophila development. Moreover, we also found several Hox genes in our set of upregulated genes (e.g., Antp, Ubx, Abd-A, Abd-B), which are classical embryonic PcG-targets shown to be important in oncogenesis. Although not regarded as a traditional hallmark of cancer (Hanahan and Weinberg, 2000), a key event in tumorigenesis is the perturbation of normal cell fate (Gonda and Ramsay, 2015). Re-expression of particular embryonic genes in an aberrant spatial-temporal pattern could contribute to oncogenesis by maintenance of a more embryonic state through the activation of anti-apoptotic pathways or suppression of differentiation (Shah and Sukumar, 2010). For example, re-establishment of an earlier developmental program has been proposed in human pediatric gliomas that frequently have mutations in histone H3 lysine 27 (H3K27M) and compromised PRC2 function (Funato et al., 2014; Wainwright and Scaffidi, 2017). Since several classic TFs with important functions during embryogenesis are among the upregulated genes in the ph505-tumor transcriptome, we subsequently blocked their expression and showed for some TFs their potential to rescue the ph knock-out phenotype and reduce tumor growth. Quantitative measurements of tumor volume in various conditions ensured the reproducibility of the data, excluding an observer bias. The observed effects of TF-KD on eclosion rate and tumor volume did not necessarily correlate with the genes that are direct targets of Ph silencing in eye discs. This is illustrated for example by the strong effects of bgcn-KD that has not been identified as a direct Ph target (Loubière et al., 2016). These observations on TFs are particularly important since transcription has a direct influence on the balance between proliferation and differentiation. Furthermore, when transcriptional regulators (TFs, co-regulators or epigenetic modifiers) are misregulated, differentiation is blocked and pre-cancer cells can proliferate (Gonda and Ramsay, 2015). kni is a gap gene involved in the subdivision of the embryo anterior-posterior axis that can function as an activator (Langeland et al., 1994) or a repressor (Pankratz et al., 1990). Besides its classic function in embryonic development, kni is subsequently also required for vein formation in wing imaginal discs (Lunde et al., 2003). We show that KD of knirps in ph505-tumors is sufficient to reduce tumor volume by 90%. It also reduces the tumorigenic capacity of ph505-tumors, as assessed by a transplantation assay. Misexpression of TFs in imaginal discs and formation of cysts has been suggested to be an indicator of precancerous lesions (Bielmeier et al., 2016). Here we show that ectopic expression of knirps in eye-antennal imaginal discs leads to the formation of cysts and is sufficient to recapitulate the phenotypic tumor appearance. Moreover, we believe that this TF, with its dual regulatory role, could activate or repress other genes and thus form a regulatory circuit that is beneficial for tumor initiation and progression. Inducing a cell fate switch can be achieved by forcing expression of a TF that can activate the transcriptional network of the resulting cell type (Yamada et al., 2014). We show that impairment of a global silencing regulator leads to reversion of neurogenesis-lineage committed cells to a less differentiated cell state, but also that this can be achieved by single ectopic expression of kni. This raises the possibility that embryonic TFs such as kni drive the establishment of a regulatory circuit that blocks differentiation. Although the involved factors of such mechanisms remain to be identified, we consider the identification of kni as a strong oncogene a valuable starting point for future studies. The identification of a tumorigenic role of the embryonic TF Kni in Drosophila, is in line with the identification of other embryonic TFs playing a role in several different tumor models. For instance, aberrant expression of the embryonic TF Oct-4 blocks progenitor-cell differentiation and causes dysplasia in mouse adult epithelial tissues (Kumar et al., 2012; Hochedlinger et al., 2005). In humans, activation of the TF TAL1, normally expressed early in the erythroid lineage, has been shown to alter a core transcriptional regulatory circuit that in turn leads to tumor onset (T cell leukemia) (Bradner et al., 2017). Additionally, other relevant embryonic TFs, such as FOXF1, normally expressed in mesenchyme-derived cells, activate MAPK signaling when expressed in prostate epithelial cells and contribute to tumorigenesis (Fulford et al., 2016). Taken together, our data show that knirps can drive tumor onset and is a strong oncogene in ph505-tumors. Moreover, our work is consistent with a growing understanding between the connections of developmental gene expression and cancer. We hope that in the long-term these findings can contribute to the development of new therapies for cancers driven by misexpression of TFs. Loss of differentiation capabilities, as well as the emergence of a progenitor-like state that promotes cellular transformation and tumor initiation are common processes observed in cancer (Roy and Hebrok, 2015; Bossuyt et al., 2009). The concept of dedifferentiation preceding tumorigenesis has been shown in Drosophila neurons, where neurons lacking the TF Lola dedifferentiate, turning on neural stem cell genes, begin to divide, and form tumors (Southall et al., 2014). We provide evidence that kni-ectopic tumors, very similar to ph505-tumors, also fail to undergo differentiation. Besides commonalities such as loss of polarity and loss of cell identity, these two tumor models also share the ectopic activation of the JAK/STAT signaling pathway. Developmental studies suggest the cooperation between JAK/STAT and gap genes (e.g. knirps) in regulating expression of pair-rule genes for segmentation during embryogenesis (Hou et al., 2002). Hyperactivation of the JAK/STAT pathway has been observed in different human cancers, where it activates survival and proliferation genes (Buchert et al., 2016). Also, cells can be maintained in a less differentiated and more proliferative state by JAK/STAT pathway activation, as highlighted by its activation in stem cell niches in Drosophila (Hou et al., 2002; Amoyel and Bach, 2012; Christofi and Apidianakis, 2013) and in mouse embryonic stem cells (Hao et al., 2006). Furthermore, there is evidence suggesting that this pathway must be switched off to allow differentiation of hematopoietic progenitors in flies (Amoyel and Bach, 2012). In agreement with this, blocking JAK/STAT activity suppresses the PRC1 mutant tumor phenotype (Classen et al., 2009) and in our hands induces the re-establishment of the differentiation program characteristic of eye-antennal imaginal discs. However, using the blockage of signaling pathways as a therapeutic target has been shown to be difficult due to the redundancy of the signaling networks and thus acquired drug resistance is common in cancer cells (Gonda and Ramsay, 2015; Buchert et al., 2016). Alternatively, forced differentiation by means of TF activation might solve this issue. We used atonal, a pro-neural TF in eye discs (Bossuyt et al., 2009) and downregulated in ph505-tumors, to ultimately restore differentiation in eye-antennal tissues. This approach proved to be sufficient to prevent tumor cells from proliferating, reduce tumor burden and recover the normal pattern of differentiation. The significance of these observations, referred to as ‘differentiation therapy’, is supported by work done in acute myeloid leukemia where therapies to overcome the cellular differentiation arrest have led to favorable outcomes (Gocek and Marcinkowska, 2011). Moreover this strategy has also been suggested to restrict the cellular plasticity of cancer stem cells (Wainwright and Scaffidi, 2017). 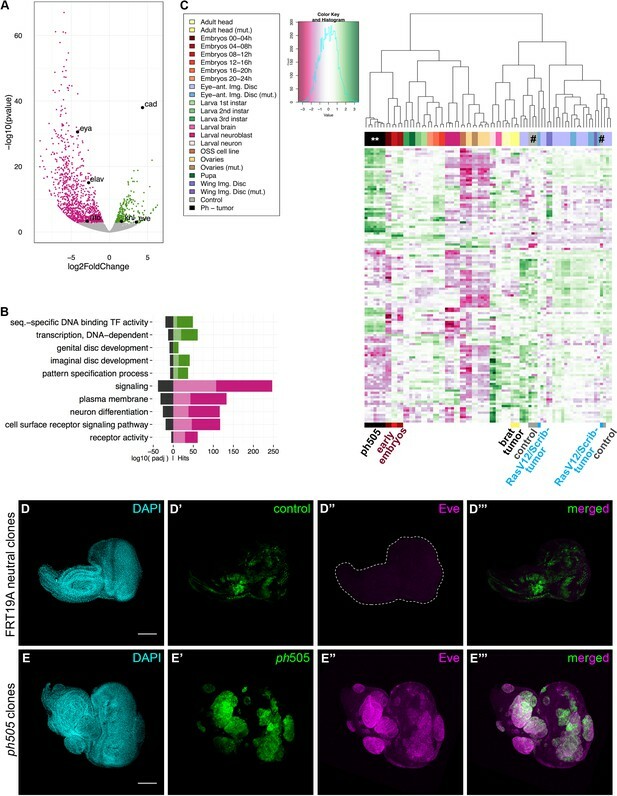 Our findings highlight the importance of embryonic transcription factors in oncogenesis and favor the potential of re-establishing differentiation as an attractive alternative in future considerations for cancer therapy. Further information and requests for resources and reagents should be directed to and will be fulfilled by the corresponding authors. Flies were maintained on standard food at 25°C and 60% relative humidity, under a 12 hr light: 12 hr dark cycle. All fly stocks used are listed in the Key Resources Table. Mitotic recombination was induced by the expression of FLP recombinase under the control of eyeless promoter (eyFlp). Additionally, using the mosaic analysis with a repressible cell marker (MARCM) system (Wu and Luo, 2006), clones were fluorescently labeled with GFP. For our mutant experiments, we used ph505 allele to knock-out both genes in the ph locus (ph-p and ph-d). For control experiments, MARCM clones were generated with a FRT19A blank stock line. Specifically, ‘19A tester’ stock line was crossed either with FRT19A, ph505/FM7 act-GFP or with FRT19A in order to generate mutant or control clones in eye-antennal imaginal discs, respectively. Larvae were examined at the late third instar stage. RNAi strains were initially balanced (#2, Cyo or #3 TM6b) and subsequently crossed with the strain carrying the mutant allele and maintained as a stock. For generation of clones and simultaneous expression of RNAi-target, the stock mentioned above was crossed with ‘19A tester’ strain. For all final crosses 25 female virgins were crossed with eight males, in order to insure that number of larvae per fly food vial would be similar and not overcrowded. Two independent crosses for each RNAi were performed. Up to three replicates were collected from each RNAi cross. Confirmation of the results obtained by RNAi KD with a knirpsmut allele could not be realized. We did not succeed in generating a recombinant mutant allele (Kni[FC13]) with a FRT element, probably caused by the expected low frequency of recombination between the two elements. For determination of eclosion rates, larvae were selected accordingly to GFP expression in eye discs, counted and transferred to a new food vial. After eclosion the number of adults was counted. Eclosion rate was measured as the ratio of number larvae over the number of adults that hatched. Images of adult eyes were acquired with Nikon SMZ1270. Third instar larvae were dissected in PBS 1x and fixed in 4% paraformaldehyde (SIGMA, #P6148) in PBS 1x for 20 min at room temperature (RT) and washed with PBS with 0.1% TritonX-100 (SIGMA, #T9284) (0.1% PBS-T) for 30 min (3 × 10 min) and blocked (0.1% Bovine Serum Albumin (Serva, #11930.04) in 0.1% PBS-T) for 1 hr at RT. Larvae were then incubated with primary antibodies in blocking solution overnight at 4°C, washed with 0.1% PBS-T (3 × 15 min) and incubated with secondary antibodies in blocking solution for 2 hr at RT. After washing with 0.1% PBS-T for 15 min, DAPI (Invitrogen #62248, 1:500) was added and incubated for 15 min at RT. Imaginal discs were then dissected in PBS 1x and mounted in a slide with Vectashield mounting medium (Vector Laboratories). The primary antibodies used in this study were: rabbit anti-Ph (Paro lab; 1:100), mouse anti-Arm (DSHB N27A1; 1:5), mouse anti-MMP1 (DSHB 5H7B11; 1:300), rat anti-ELAV (DSHB 7E8A10; 1:30), mouse anti-eve (DSHB Eve3C10; 1:100), rabbit anti-cad (Macdonald lab; 1:500), mouse anti-Eya (DSHB eya10H6; 1:500), goat anti-Hth (H. Sun; 1:100), mouse anti-Abd-B (DSHB; 1:10), rabbit anti-Dcp-1 (Cell Signaling 9578S; 1:200), rabbit anti-pH3 (Millipore 06–570; 1:200). Appropriate combinations of Alexa-coupled secondary antibodies were subsequently applied. Phalloidin-633 (Life Technologies A22284, 1:100) was used for actin staining. The secondary antibodies used were: goat anti-Rabbit Alexa 568 (Life Technologies., Bleiswijk, Netherlands, A-11036), goat anti-mouse Alexa 568 (Life Technologies, A-11031), goat anti-rat Alexa 568 (Life Technologies, A-11077), donkey anti-goat Alexa 594 (Life Technologies, A-11058). All secondary antibodies were used at 1:500 dilutions. Samples were analyzed with a Leica SP5 or SP8 confocal microscope. Images were processed using ImageJ and were assembled with Adobe Photoshop. Transplantation assays were performed according to previous reports (Rossi and Gonzalez, 2015). Briefly, eye-antennal discs of genotypes of interest (either ph505; ph505, kni-KD; or FRT19A, UAS-Kni) were cut into small pieces and transplanted into the abdomen of female hosts (w or wild-type Oregon R). Transplanted hosts were kept at 25°C and monitored for GFP+ overgrowth mass. Number of tumor-bearing hosts was assessed every week upon transplantation. 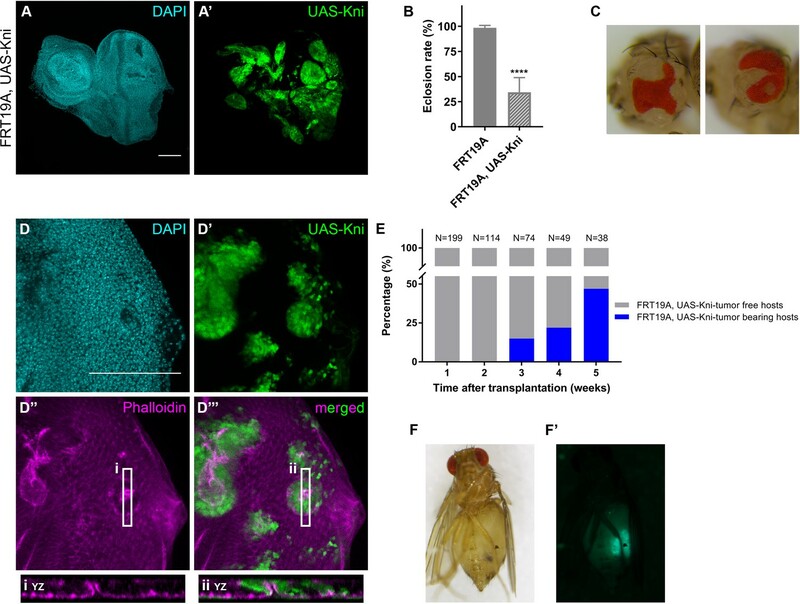 Transplanted hosts with ph505 tissues were used as control to account for pathogen contaminations, temperature changes or other issues that could affect the survival of the flies. Adult hosts were analyzed and images were acquired with Nikon SMZ1270. Protocol for sample preparation for RNA-sequencing was adapted from published work (Harzer et al., 2013; Martinez et al., 2009; Dutta et al., 2013). Each biological replicate for FACS was composed of a total of 200–250 eye-antennal imaginal discs of third instar larvae dissected in PBS 1x. After spinning down and removing PBS 1x, imaginal discs were placed in low-binding 1.5 mL tube with 200 uL of saline solution containing collagenase (25 discs/tube) (collagenase SIGMA, C1639 - 1.5 mg/mL diluted in Rinaldini’s saline solution) and incubated at RT for 45 min, 300rpms. Tubes were agitated every 15 min and mechanical digestion was performed twice during collagenase incubation (pipetting up-and-down with 27G syringe). After digestion, tubes were pooled in a total of 2 1.5 mL tubes and centrifuged for 25 min, 300 g, 4°C. Supernatant was removed and pellet was resuspended in PBS 1x. Solution was filtered and shortly kept on ice before proceeding for FACS. Several rounds of FACS-sorting were performed from pools of ph505 eye-antennal discs, using a BD FACS Aria cell sorter (BD Biosciences) of the FMI FACS facility (FMI, Basel) and data was collected on the basis of FSC/SSC parameters. Sorting time was kept below 45 min to insure the maximum viability of the cells. Two populations of cells were collected separately, GFP+- (mutant cells) and GFP--sorted cells (control), directly into extraction buffer (200 µL, PicoPure RNA isolation kit, Thermo Fisher, KIT0204). RNA extraction was performed accordingly to manufacturers instructions, including a step of DNase treatment (Qiagen, catalog #79254). Samples were eluted in the final volume of 11 µL and kept at −80°C. RNA concentration (RiboGreen, ThermoFisher, #R11490) and integrity (Fragment analyzer, AATI) of sorted samples was assessed by the Genomics Facility Basel (D-BSSE, Basel). From the several rounds of samples’ preparation, we choose 4 pairs of samples (tumor and matched-control) and three extra tumor samples from batches where control cells did not have the desired quality, to prepare libraries for sequencing. Due to the low amount of RNA in these samples, libraries were prepared by the Genomics Facility Basel using a method conceived for single cell RNA-seq (Smart-seq2) (Picelli et al., 2014). The following steps were performed on 22 libraries. There were two technical replicates per sample corresponding to a total of 11 samples (seven tumor, four control). The libraries were sequenced in paired-end mode (2 × 150 bp) in a NextSeq500 (Illumina), and insert sizes around 300 bp (ungapped forward and reverse tags). Adaptor clipping and quality trimming was performed with Trimmomatic (Bolger et al., 2014) (v0.30), after initial quality checks with FastQC (v0.11.2, www.bioinformatics.babraham.ac.uk/projects/fastqc/). Reads were aligned using the splice aware aligner STAR (Dobin et al., 2013) (v2.3.0e) and subsequently filtered to remove potential PCR-duplicates with Picard Tools (v1.121, broadinstitute.github.io/picard/). Transcript counts were produced with HTSeq (Anders et al., 2015) (v0.6.1) using the Ensembl 78 annotation (Aken et al., 2016). The subsequent differential expression analysis was performed in R (v3.1.0, www.r-project.org) using the DESeq2 package (Love et al., 2014) (v1.6.1), neglecting one library (technical replicate), which did not meet quality standards. All the differentially expressed genes were submitted to the”WEB-based GEne SeT AnaLysis Toolkit’ (WebGestalt (Wang et al., 2013), www.webgestalt.org), submitting either all differentially expressed genes at the same time, or splitting them into up- and down-regulated genes. For the in vivo screen, we decided not to exclude candidates based on their log2 fold change, as is commonly done, but rather selected candidates based on a stringent adjusted p value (padj. <0.01) and a-priori knowledge. RNA-seq profiles of our tumor and control samples were compared with available D. melanogaster datasets (Figure 1—source data 3), specifically comparing 124 differentially expressed TF-encoding genes (Figure 1—source data 4). All additional samples (fastq-files) were obtained from the Gene Expression Omnibus (GEO, www.ncbi.nlm.nih.gov/geo/) and processed in a similar fashion as the original 11 samples. For single-end-libraries, the removal of duplicates was not performed. Settings in Trimmomatic were adjusted for each sample, taking into account the sequencer type and read lengths. All samples were aligned with STAR and counting was performed with HTSeq. Hierarchical clustering was performed after normalizing gene-expression values with DESeq2. The expression values after variance stabilizing transformation were then mean-centered for each gene. Hierarchical clustering was performed between samples using 1-Pearson correlation as distance measure, while genes were clustered using Euclidean distance. The datasets used for comparison were retrieved from the following references: (Graveley et al., 2011; Gan et al., 2010; Jüschke et al., 2013; Potier et al., 2014; Berger et al., 2012; Naval-Sánchez et al., 2013; Czech et al., 2013; Atkins et al., 2016). Images of eye-antennal imaginal tissues were acquired using 20x or 40x objectives on the Leica SP5/SP8 confocal microscopes and processed using ImageJ or Imaris. Images of adult eyes or transplantation hosts were acquired with Nikon SMZ1270. As a measure of tumor volume, we quantified the space taken up by the tumor in these tissues employing a quantification pipeline developed in our lab (Beira et al., 2018). To automate image segmentation and identification of clones across imaginal discs, we used Ilastik (Interactive Learning and Segmentation Toolkit, [Sommer, 2011]) to build an unbiased supervised learning classification of clone regions and surrounding tissue (with 5 ph505-tumor eye-antennal imaginal discs). Confocal images of tissues of interest were acquired with a 0.8–1.1 μm z-stacks. The classification method was then used for the test set of ph505-tumor tissues (N = 50), as well as upon perturbation (either TF-KD or overexpression of ph, p35 and ato). After unbiased classification of clones, a Matlab script (kindly developed by Aaron Ponti, SCF, D-BSSE) was used to enable us to use Imaris (Bitplane) in order to obtain volume data for each spatially defined clone, total clone number per tissue, and tissue volume (DAPI). Tumor volume (%) was then calculated as the ratio of tumor volume (sum up volumes of all GFP-clones in a tissue) over the size of the respective tissue (volume, DAPI). In order to measure proliferation levels, we quantified the number of phospho-histone H3 (pH3) positive cells within eye-antennal imaginal discs in the four conditions of interest (FRT19A; FRT19A, UAS-ato; ph505; ph505, UAS-ato). We used Imaris (Bitplane) for semi-automated image segmentation of total tissue volume (DAPI), total volume of clones (GFP+ cells) and number of pH3+ cells. In addition, we used the segmented GFP signal to mask voxels of the pH3 +channel inside and outside of GFP positive cells to zero. In this way we were able to measure pH3+ cells inside and outside the clones. To account for differences in the size of tissues and clones, we normalized the data accordingly. For the ‘whole tissue’ condition, total numbers of pH3+ cells were normalized to total tissue volume (per tissue); for ‘inside clones’, numbers of pH3+ cells within clones were normalized to volume of GFP+ cells per tissue; for ‘outside clones’, numbers of pH3+ cells outside of GFP+ clones were normalized to volume of GFP- cells per tissue. Values of pH3+ cells are represented per mm3. GraphPad Prism 7.0 was used for statistical analysis and generation of the graphical output. No statistical analysis was used to predetermine sample size. Sample sizes (N) and p-values are indicated in the figures and/or figure legends. Statistical tests used: Kruskal-Wallis with Dunn's multiple comparisons test for eclosion rate, tumor volume (%), number of clones and number of pH3+ cells; one-way ANOVA with Dunnett's multiple comparisons test for tissue size and average tumor volume. ****p<0.0001; ***p<0.001; **p<0.01; *p<0.05. All data points represented by dots in the plots for tumor volume, average tumor volume, tissue volume, number of clones and number of pH3+ cells per tissue are randomly distributed along x-axis. The accession number for the sequencing data reported in this paper is GEO: GSE101463. Deregulated homeobox gene expression in cancer: cause or consequence? Advances in Biochemical Engineering/Biotechnology 135:79-110. Current Protocols in Stem Cell Biology 27:Unit 2F.2. IEEE International Symposium on Biomedical Imaging: From Nano to Macro. pp. 230–233. STEM CELLS Translational Medicine 3:1182–1187. Thank you for submitting your article "A switch in transcription and cell fate governs the onset of an epigenetically-deregulated tumor in Drosophila" for consideration by eLife. Your article has been reviewed by three peer reviewers, and the evaluation has been overseen by a Reviewing Editor and K VijayRaghavan as the Senior Editor. The following individual involved in review of your submission has agreed to reveal his identity: Georg Halder (Reviewer #2). 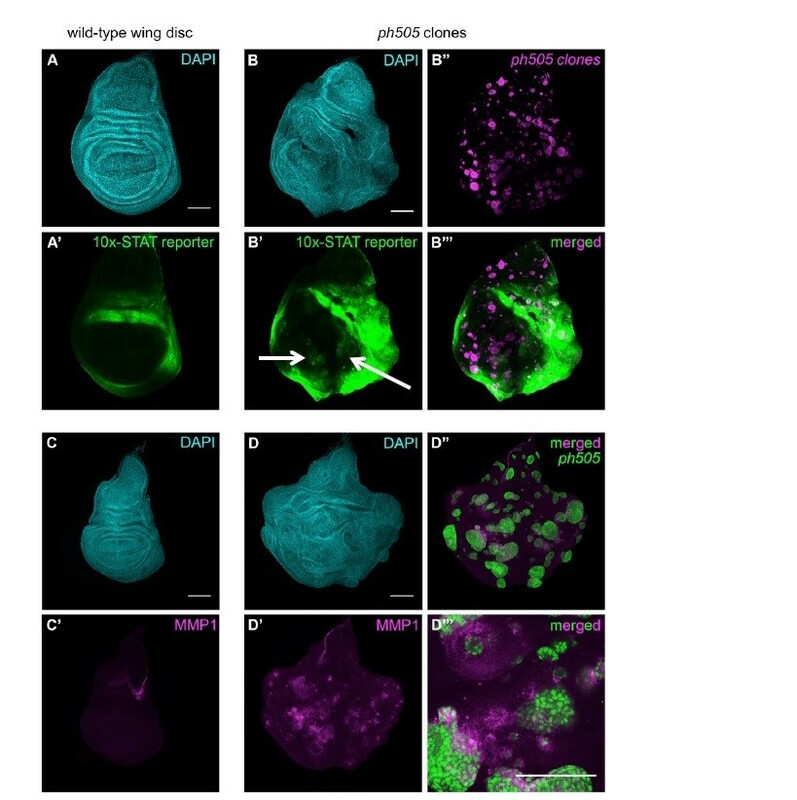 In this study, the authors introduce a tumor in Drosophila imaginal discs via loss of the epigenetic regulator polyhomeotic. They provide data to suggest that the acquisition of a tumor fate is due to a reprogramming event toward an earlier developmental stage. They further identify knirps as a key regulator of this new transcriptional program, providing the first evidence that Knirps can function as an oncogene. This interesting and well written paper contributes to an emerging theme in tumor development that tumors represent a distinct, but abnormal cell fate and that tumors have their own developmental networks. Torres, et al. utilize a tumor that is independent of Ras activation and find that the polyhomeotic tumors activate a different kind of program from that of previously characterized Ras driven tumors, bringing novelty to the field. Despite the strong difference in gene expression and network architecture, the authors observe similar roles for JNK and JAK/STAT signaling pathways in promoting many of the tumor phenotypes as has been noted for other tumors. Technically, the authors do a nice job of combining genetic and transcriptomic data. They also are successful with FACS and tumor transplant analyses, which are technically challenging in this system. However there were several points that all reviewers agreed must be addressed before this manuscript is acceptable for publication in eLife. 1) The authors posit that ph505 cells may undergo dedifferentiation. This would be an interesting finding, but it would require first showing that the clones differentiate at an earlier developmental time point, then lose that cell fate. If the authors truly believe that dedifferentiation occurs they should show data which supports this conclusion. As the ph clones are induced in first instar, and transcriptomics supports that they have an embryo-like fate, it may be that the clones simply fail to undergo differentiation. The authors must show data to support this claim, or re-word the manuscript. For example, what is the transcriptome of a first instar discs? 2) The control of the RNA-seq are the GFP-negative cells from FACS sorting. What about differential expression compared to wild type EA discs? 3) Among the 75 samples used to compare, why was Ras/Scrib not included? That is typically used and for this tumour plenty of microarray and RNA-seq data are available. 4) How general are their findings? Do ph clones give rise to tumors in other tissues as well? The authors should test the effects of ph clones in other tissues, and address autonomy of ph clones effects. 5) Autonomous vs. non-autonomous effects should be addressed: ELAV that marks photoreceptors (PR) is used as a differentiation marker. ph clones lose ELAV and it is re-established when kni, the embryonic TF, is knocked down or Ato, required for PR differentiation, is expressed in these cells. What is puzzling is that adult eyes from discs with ph tumors display normal looking PRs in higher numbers. If ph mutant cells themselves are ELAV negative, then the surrounding wild-type cells must be forming these excessive PRs. As the authors cite (Feng et al., 2011), there is a non-autonomous component to the ph phenotype, which was proposed to be caused by JAK/STAT induction in neighbouring cells. So, are the tumors formed by the ph cells or their wt neighbours? This is a very important point as it changes the way the RNA-seq data would be interpreted. The authors state in the Discussion that the differential expression analysis was done comparing GFP (+) and (-) cells in discs with ph mutants. I think, comparing GFP (+) cells from discs with ph mutants to GFP (+) cells from discs with wt clones would be important as well, the same goes for GFP (-) cells. 6) Is Knirps a key regulator of the downregulated genes? The authors speculate on this point, but should include the analysis of the downregulated genes in iRegulon as this would reveal if Knirps is implicated as a key regulator in both sets. 7) Ato overexpressing clones in normal tissue appear to be small. The ELAV pattern in these discs is also somewhat disrupted. While overexpression of Ato clearly prevents tumor overgrowth in this model, it is unclear if this is due to actually inducing differentiation or if Ato overexpression simply prevents cells from proliferating. The authors should clarify this point, which may require EdU or pH3 stainings to address the proliferation, along with quantifications of normal relative to tumor clones sizes. We thank reviewers for bringing up this issue to our attention. Indeed, the term ‘dedifferentiation’ was used to refer to a developmental reversion or cellular reprogramming event, such as eye-antennal imaginal disc to embryo-like identity. Ph-tumors do not express neuronal markers and express embryonic TFs, suggestive of a switch of cell fate, potentially through a dedifferentiation step. Dedifferentiation is a common event observed in cancer development (Southall et al., 2014). However, we agree that if the term dedifferentiation is used in the context of eye-antennal disc development (as pointed out by the reviewers), only tumors arising from differentiated cells (late third instar) would in principle be able to go through dedifferentiation, as first instar larvae discs are composed of undifferentiated cells. In the system we used, MARCM-GFP clones are induced from an earlier stage of eye-antennal disc development. We confirmed this again ourselves by checking GFP-signals in late first-instar discs (Author response image 1). Technically, the dissection of first-instar imaginal discs is very challenging. We succeeded to isolate imaginal discs attached to brain tissue for imaging, but we do not have the technical capabilities required for dissection of first-instar discs that are intact and in a considerable amount required for transcriptomic analysis (several hundreds). We also could not find published gene expression datasets from first-instar EA discs (to our knowledge, these are not publicly available). Eye-antennal imaginal discs from different developmental stages carrying ph505-clones (A-C). Mutant cells are GFP labeled and present in late first instar EA discs (A). Pictures were taken with the same objective in a wide-field microscope (scale bar = 100μm). EA, eye-antennal imaginal disc. OB, optic lobe. Given the technical challenges to obtain such transcriptomic datasets at this point, we sought an alternative approach to test the point raised by reviewers. Our goal was to ask whether a differentiated cell, once mutated and tumorigenic, would return to a less differentiated state. To this end, we attempted to generate mutant clones at a later stage of eye-antennal imaginal development, when differentiation cues are already established, so that we could assess whether these late mutant cells would still lack differentiation markers. First, we defined a time-point when the wave of differentiation has started and cells received signals to differentiation. This wave of differentiation follows the morphogenetic furrow (MF) and progresses in a posterior-to-anterior direction. In our hands, and as previously reported (Chanut and Heberlein, 1995), at early third instar (96h AEL) this differentiation wave has started. We could confirm this by the obvious presence of the MF (marked with white arrows, Author response image 2) and the ELAV positive staining of the posterior cells located further away from MF. However, there is some variation of the number of cells that express ELAV between different larvae, as you can appreciate between left and central pictures (Author response image 2). Additionally, using a later time point when there is less variability and more cells express ELAV (120h AEL) might not be ideal since discs would need to be dissected a day later, which would not allow sufficient time to robustly generate tumor clones. Expression of ELAV (magenta) in developing eye-antennal imaginal discs (EA), 96h and 120h after egg laying (AEL). White arrows, morphogenetic furrow. DAPI, cyan; magenta, ELAV staining. Scale bar 100μm. We thus tried to generate tumor clones at early 3rd instar (96h AEL) where differentiation has started by using a heat shock flippase and later check the expression of ELAV (2 days after heat shock). In particular, we checked the ELAV expression in clones that are located in the most posterior region of the disc, making sure that these clones are generated after the MF was already anterior to them. Our results showed that some clones generated in the posterior region of the disc (at 96h AEL) do not express ELAV (Author response image 3), suggestive of a dedifferentiation event in ph505-tumor clones. However, it is difficult to find clones in this region and in addition be entirely certain that this is indeed due to the tumor development and not simply a result of a developmental delay when clones were generated. Since we have generally used the eyFlp/MARCM system, we cannot completely exclude a potential effect of a developmental delay; hence, we tend to agree with the reviewers that one needs to be cautious in using the term dedifferentiation. In light of these considerations, and even though we observed some cases supporting our initial claim, we decided to re-word the manuscript to reflect a more accurate description of the condition (e.g. ‘failure to differentiate’). Expression of ELAV in mitotic clones generated 96h AEL. Heat shock (HS) experiments were performed at 96h AEL (90min, 37ºC). Control experiments were done with FRT19A neutral clones (left side, GFP clones), where clones are very small at 6 days AEL, and with normal expression of ELAV. Mutant clones (GFP clones, central panel) were generated and some EA showed defects in ELAV patterning, as depicted in higher magnification in the panel on the right (white dashed arrow). Scale bar 100μm. This project was designed with the aim of defining the transcriptional signature of ph505 tumors by comparing mutant cells with adjacent non-mutant cells. From the initial design, we found it important to define a tumor-signature that would be targetable by genetic tools specifically inside the mutant-clones. These considerations led us to selectively isolate GFP-positive (tumor cells) and GFP-negative cells which had undergone the exact same experimental procedure (including FACS sorting). One of the main benefits of this approach was that it allowed us to identify a mutant-specific signature and not a tumor tissue signature (mix of mutant and non-mutant cells), while minimizing artifacts generated by alternative experimental conditions. We believe this actually brings an advantage to the field regarding other published approaches using bulk material. The expression profiles of these GFP-negative cells also resembled the profiles of other published EA transcriptomes, which is also apparent from the clustering analysis based on TF expression levels (Figure 1C in the manuscript). Nevertheless, in order to address the question posed by the reviewer, we performed differential expression analysis comparing our tumor transcriptomes against several available datasets of wild-type EA discs (which had already been included in our clustering analysis). The conclusions one can draw from such an approach are limited, as differences in gene expression levels through this analysis can arise due to batch-effects. Because of batch effects and the higher number of samples, we expected to find a higher number of differentially expressed genes, which was indeed the case. The total number of differentially expressed (DE) genes increased over 4-fold (padj<=0.01) when comparing GFP+/tumor with wild-type EA (Author response image 4A). However, the general tendencies were conserved in both analyses; e.g. a higher number of genes is downregulated (DOWN vs. EA, Author response image 4B) compared to up-regulated. Also, log2-fold-changes were correlated (r=0.624) between the two approaches. Differential Expression analysis – comparison of ph505-tumor cells (GFP+) with wildtype EA discs. (A) Venn diagram showing the overlap (1088 DE genes) between the previous analysis (DE vs. GFP-) and the new analysis (DE vs. EA). (B) UpSet intersection diagram shows detail information about overlaps of down- and upregulated genes across two approaches of DE analysis. Some genes are exclusively found in some approaches (as 2764 genes are DOWN-reg in a GFP+ tumor vs. wt EA), while others are commonly found across analysis (as e.g. 859 DOWN- in both differential expression analysis). Common genes found across different approaches are depicted with connection line between the 2 fractions. We found that from the 1337 DE genes obtained with our initial analysis (GFP+ vs. GFP-), 1088 (81%) are commonly found DE by comparing ph505-cells (GFP+) with wild-type EA discs. This included genes like kni, cad and drm that we tested as candidates in our RNAi screen. Moreover, we showed that knocking-down either of these 3 genes led to major reductions in tumor volume, revealing for the first time their importance in ph505-tumors. We also note that our initial approach retrieved a considerable number of other genes (not detected in comparison to wt discs), supporting the power of our early approach. The comparison between GFP+ and GFP- cell populations recovered 249 DE genes not found when comparing to wild type tissues, 191 down- and 58 upregulated (UpSet plot, Author response image 4B). Among these genes are e.g. Abd-A and bgcn (a germline differentiation factor that led to a 32% reduction in tumor volume when KD in ph505, similar to the effect observed when KD TFs as cad or drm). This example highlights the importance of comparing GFP+ and GFP- cells from the same tissues, as such targets would otherwise have been missed. We have now included RNA-seq samples from RasV12/Scrib- eye-antennal tumors (Atkins et al., 2016) in our analysis (see modified Figure 1 in the manuscript), which were not available when this initial analysis was performed. Including these samples did not alter the previous clustering results. Ph tumors cluster with early embryos while our control samples cluster with other EA disc samples (either wild-type or mutant). Thus, Ph tumors present a TF-signature that is different from other tumors (as RasV12/Scrib-) and more similar at this level to embryos. We recognize the importance of assessing the effects of ph mutant clones in other tissues. We made significant efforts to address this point and expand the knowledge from previous observations. ph mutant clones, generated with a different allele (ph504), were previously shown to induce cell polarity defects with formation of cysts, and expression of Polycomb targets (e.g. Abd-B) in wing imaginal discs (Gandille et al., 2010). In addition, another study that used the cell-lethal system in combination with UbxFlp, showed that ph505 mutant cells lead to tissue overgrowth (Classen et al., 2009). We also carried out some experiments ourselves, by assessing the effect of ph505 clones in wing discs and addressing the cell autonomy of these clones, as requested by the reviewers. We have generated ph505 clones using UbxFlp, and also observed cyst formation (Author response image 5B’). These cysts, in analogy to what happened in EA discs, show ectopic expression of embryonic genes, as shown here for Caudal (Author response image 5B’’-B’’’). This is suggestive of a cell fate switch, although at this stage we cannot exclude the possibility of the involvement of a slightly different transcriptional network, for which additional work would be needed. Generation of ph505 mutant clones in wing imaginal discs. (A) Control clones generated with FRT19A blank and UbxFlp present notchy-shape (A’) and do not express Caudal (A’’). (B) ph505 clones generated in wing imaginal discs, similarly to what was observed in eye-antennal imaginal discs, have round shape (B’) and ectopically express the embryonic TF Caudal (Cad, B’’-B’’’). Scale bar 100μm. As requested by the reviewers, we also assessed the non-autonomous effect in these tissues. We started by checking the activity of the JAK/STAT pathway, as it was previously shown to play a role in EA discs (Classen et al., 2009; Feng et al., 2011). We found examples of wing discs that show a non-autonomous effect within the wing pouch (Author response image 6B’-B’’’, white arrows), while the JAK/STAT reporter is not normally expressed in the pouch of wild-type wing discs (Author response image 6A’). In addition to this, and following on a previous observation, we also addressed the contribution of the JNK pathway to non-autonomous effects. For this purpose, we have checked the expression of a JNK target, MMP1 (metalloproteinase 1). Similarly to what we have shown in our manuscript for ph505 clones in EA discs, MMP1 is ectopically expressed in mutant clones, in comparison to control wing discs (Author response image 6C’-D’). Moreover, in some clones MMP1 expression is observed in cells surrounding the clones (Author response image 6D’’’), suggestive of a potential role for JNK in non-autonomy of these clones. In addition to these observations in the wing disc, we have also examined other tissues within the laboratory. In summary, our unpublished observations revealed that ph mutant cells did not generate tumors in the brain (possibly due to cell death); Finally, some preliminary observations (which we aim to strengthen in the future) show that ph mutant cells can give rise to tumors in the adult fly gut (another epithelial tissue). Hence, there is a more general tumorigenic potential of ph mutations, which seems to be particularly impactful in epithelial tissues (which are the tissue type where many human tumors also arise, e.g. carcinomas). JAK/STAT and JNK (MMP1) pathway activation in ph505 clones in wing imaginal discs. (A) Expression of the 10x-STAT reporter in wild-type wing imaginal disc. (B) ph505 clones generated in wing imaginal discs show ectopic expression of the reporter inside the pouch (B’-B’’’). (C) MMP1 expression in wild-type wing imaginal disc. Ectopic expression of MMP1, a target of JNK, in ph505 clones (D). Inset (D’’’) showing non-autonomous expression of MMP1, suggestive of a role for JNK in non-autonomous effect of these clones. Scale bar 100μm. The point that the reviewers raise is very valid, and we tried to tackle this aspect in several ways. First, we performed a quantitative analysis in order to assess the volume taken by ELAV+ (differentiated) cells in the eye disc (Author response image 7), and indeed we observed that there are more PR precursor cells in discs carrying tumors (shown in the blue bar plots on the left). As ph505-cells are mostly negative for ELAV, we focused on the surrounding non-mutant cells (GFP-) that might be responsible for formation of excessive number of normal looking PRs. We confirmed that the difference observed was attributed to the surrounding cells (purple bar plots on the right), in agreement with the reviewers’ point. However, if these non-mutant cells were tumorigenic, one would expect that upon transplantation they would also contribute to the tumor mass, which we never observed, however. Hence, this strengthens our position that tumorigenic cells are GFP+ ph mutant cells, while the surrounding tissue is not (even if it may overgrow due to non-autonomous effects, as previously shown (Feng et al., 2011)). Quantitative analysis of tissue volume occupied by ELAV+ cells. Number of tissues used for quantification analysis (using Imaris): FRT19A N=12; ph505 N=19). Trend of increase in absolute volume of ELAV+ inside tissues carrying ph505-tumor clones is observed, in comparison with FRT19A (in blue). This trend is enhanced and significantly different when looking specifically at volumes outside of clones and thus GFP- (in purple). Blue bars – total volume of ELAV+ per tissue. Purple bars – fraction of ELAV+ that does not overlap with GFP, and thus fraction ‘outside of clones’. * = p<0.05. It is important to note that the phenotype that triggered the concern (‘higher number of PRs’) has a low penetrance, as only 20% of larvae carrying tumor tissues eclose (see Figure 1—figure supplement 1C). It becomes difficult to disentangle this issue, as one cannot be certain about which larvae survive to adulthood (e.g. the surviving 20% could actually be among the ones that were composed of smaller tissues and smaller tumor clones). Nevertheless, we still tried to address this point in an unbiased and quantitative manner (see above), leading us to conclude that the overgrowth phenotype observed in the eclosing adults is likely due to compensatory mechanisms during the development of eye-antennal disc with formation of tumor clones. Furthermore, observations made with the cell-lethal system in EA discs (Classen et al., 2009) showed that even in the absence of non-mutant surrounding cells, the tissue still overgrows. Thus, the overgrowth phenotype is not exclusively due to wt cells, but they do contribute and support this phenotype (see also our response to point 4). Taken together, these observations indicate to us that it is important to distinguish between tumorigenic (mutant) and overgrowth phenotypes. Based on previous reasoning, we consider that further comparison of GFP+ and GFP- transcriptomes from wild-type tissues could be of interest to distinguish these two populations, but this approach would be technically challenging (wild-type tissues are 4-times smaller, see Figure 2—figure supplement 1C), and would diverge from the focus of our work. It was very challenging to set up the workflow for sample preparation for RNA-seq from ph505-tissues. We believe that the suggested experiment would require an even higher number of tissues (perhaps over 1000 discs), and their dissection would also need to be done in less than an hour to avoid cell death, making it impossible for us to achieve at this point. In sum, the design of this study was targeted at comparing mutant cells with adjacent cells (non-mutant) within the same tissue. It is possible that adjacent cells contribute to compensatory growth (Uhlirova et al., 2005). One of the strong points from our work is the extended in vivo validation presented in the manuscript. This serves as good evidence that our strategy has been successful in identifying key regulators in mutant cells, and with a functional validation through KD which led to considerable effects in the tumorigenic capacity and overall tissue overgrowth. The initial analysis using iRegulon (as mentioned in the manuscript) was done with all DE genes (1337) as input. Indeed, Knirps, among others, was enriched as a regulator of targets that are DE in our dataset. The question posed by the reviewers is one that we had already asked ourselves: Knirps is a well-known short-range repressor, leading us to consider if Knirps could be partially responsible for the putative repression of downregulated genes. We have now extended the iRegulon analysis, partitioned into downregulated genes as input. The output revealed that Knirps is indeed among the possible regulators of these genes, in agreement with its repressive function. Conversely, when we provide the list of upregulated genes as input, Knirps ectopic expression does not seem to be directly contributing (at least from motif enrichment analysis), which is expected given its main role as a repressor. We have also clarified the main text of the manuscript. We understand the concern raised by the reviewers. Indeed, it has been previously shown that atonal reduces ectopic proliferation in ‘eyeful discs’ (Bossuyt et al., 2009), highlighting the relevance of this question. We went further to characterize if Ato overexpression prevents ph505-tumor cells from proliferating (see modified text in the manuscript and the addition of new data in Figure 6 and new Figure 6—figure supplement 2). We performed phospho-histone H3 (pH3) stainings in the four conditions of interest, followed by quantitative analysis (see Materials and methods). The results show that a higher number of proliferating cells was present in ph505-tumor tissues in comparison to control tissues (FRT19A). Moreover, this overall increase in proliferation was largely due to cells outside of ph505 clones (Figure 6—figure supplement 2). Forcing expression of atonal in ph505 mutant cells resulted in an overall reduction of proliferation in these tissues, due to a reduced number of proliferating cells inside mutant clones co-expressing atonal (Figure 6G in the manuscript). In summary, atonal expression prevents cells from proliferating and thus counterbalance the overgrowth phenotype of ph505 cells. The expression of atonal in ph505 clones led to a dramatic reduction of tumor burden (from 46% to 3%), and ultimately to a normal eye differentiation pattern. This question was thus helpful for us to obtain detailed information, as highlighted in the modified manuscript. The authors would like to thank Hubertus Kohler from FMI for support with FACS sorting, D-BSSE Single Cell Facility for support with confocal microscopy and Aaron Ponti for help with the image quantification pipeline, D-BSSE Genomics Facility Basel for support with sequencing and Katja Eschbach for library preparation. We thank H Sun, P Macdonald, A-M Martinez, T Xu, J Hombría, F Maschat, M Affolter, S Kurata and G Mardon for sharing reagents and fly stocks. Fly stocks from the Bloomington Drosophila Stock Center (NIH P40OD018537) and antibodies from Developmental Studies Hybridoma Bank (DSHB) were also used in this study. JT is a member of the Life Science Zürich Graduate School (PhD Program in Molecular Life Sciences). JVB is supported by an EMBO long-term fellowship (ALTF1131-2014 and Marie Curie Actions LTFCOFUND2013/GA-2013–609409). Research in RP’s laboratory is funded by the Swiss National Science Foundation (SNF grant 31003A_143922) and the ETH Zürich. © 2018, Torres et al.